Whether you have printed the fabric yourself on your own computer printer, or had someone print it for you, you have worked hard making this print and spent your good money on the ink and fabric. So let’s look at some ways to take care of it all. 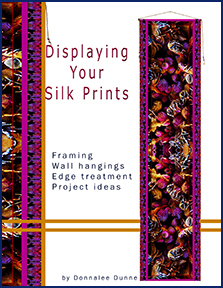 Although this article refers specifically to silk prints, information is appropriate for all prints, whether on paper or cotton fabric or on silk, whether store-bought or printed at home. Whether your silk print is now a scarf, a sewn item, or a wall hanging, there will be a certain amount of atmospheric elements that affect it. The major one is light, specifically ultraviolet (UV) light which we know will harm us over time, and will as well harm silk and fade the inks. We know paint fades over time, be it on a car, a house, or signage along the street. Ink fades as well, some types faster than others. In part this is due to the formula, but is mainly due to UV light, and your print will fade as well when exposed to light. There are products available at art stores as well as online which will protect prints hung on a wall. Framing your prints and placing glass over them will greatly reduce fading in ordinary room light. Paper prints are damaged by light over time, some papers more so than others. You know what happens to a newspaper left outdoors too long. Printed and dyed fabrics, whether done by you the artist, or purchased at the fabric store, or garments you wear, will fade in time when exposed to sunlight. Silk is an animal fiber. Just as sunlight will burn your skin over a period of time, so will sunlight harm the silk fibers, weaken them, and eventually destroy them, as well as the color fading. Say you have protected the print either by placing the wall hanging under glass or by applying a protective coating, or you don’t wear your scarf in daylight any more than necessary. You have done all you can. But other atmospheric effects are also present. Even in the cleanest home and business environments the air is filled with tiny dust particles. Over time these are collected by, and built up on, whatever is in that environment. The car gets dusty. You know furniture must be dusted. The floors must be vacuumed. If your silk is framed, you are only concerned with occasionally wiping the glass. If it is hanging without something shielding it, even with a UV coating, dust will accumulate. Dust will gather on a scarf or other clothing in the closet. A hair dryer with no heat can blow the dust away – probably the best method. Sure, all you have done is move the dust, but it is a gentle way to get it off the silk. If it is hanging loosely, you can gently shake it – the whole or a section at a time. A large, sturdier piece can be gently vacuumed with a low setting of a ‘dust buster’ type hand vacuum. Be careful it doesn’t get sucked in so you may want to test on something first. Your wall hanging probably will never need further cleaning than a little dusting. But your wearables are subject to much more than simple atmosphere. Your scarf can get soiled or stained, be it a grease spot from food or makeup, a child’s muddy fingerprints, cat hair that won’t shake out, or anything else that clothing contracts. Store-bought, commercially manufactured scarves are a different entity. Most were printed with commercially available dyes and have come with care instructions to follow. Some may be dry-cleanable, some may be hand washable. Or both. If it has a tag, follow those instructions. However, if you are dealing with an article of clothing you have printed yourself or you no longer have care instructions, if any, that came with the silk you printed on - what to do? Virtually all late models of printers have archival inks. We aren’t talking about a dye sublimation process. We aren’t talking of transfer products which you iron on. We are talking about what you have actually printed on the scarf with your desktop printer. The same little printer you print internet coupons and family photos and copies of email to keep. Some manufacturers of paper-backed silk for printing state you cannot dry clean their product. Some say you can wash. There is really no industry standard on care of home-printed silks because, once more, formulas vary. On cotton fabrics printed at home, tests have been made - quilters rejoice - and cotton washes about the same as comparable fabrics from the stores. However, silk is a different animal. It is literally animal fiber while cotton is plant fiber. Silk fibers are among the very strongest when dry, but is a delicate fiber when wet. If your ink is archival, as in pigment, you should be able to hand wash with care. 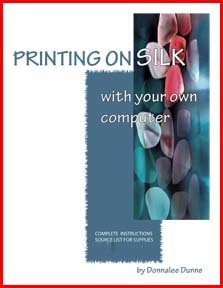 If you have printed the silk yourself, you undoubtedly have another print you made which you didn’t make into a scarf. Test this extra print to see what happens when it gets wet before you actually wash your scarf. But all should be just fine. This is a print on cotton broadcloth, on a paper backed sheet just like you may have purchased. The image on the right is the original print. On the left, the print was washed by hand - not once, but 12 times. You can see a bit of fray at the bottom, and a slight shrinkage, but the colors and details are identical. Dry cleaning isn’t dry as you probably know. At the cleaners, items are put into machines resembling your home washing machine where chemicals, rather than detergent and water, remove soil through cycles - just as in your washer, only with solvent, not water. It is then tumbled dry. It may be the chemicals, it may be the agitation of the machine, but some people have had sad results in taking their silk prints to a cleaner. Dry cleaning may be compatible with the ink in your printer, and the silk process done to your silk, and the particular chemical the cleaner uses. But there are reports of printed scarves coming back faded or almost entirely gone from the silk. It doesn’t seem like a good idea to pay good money to have the scarf ruined – although through no fault of the cleaning establishment. On the positive side, I did experiment and took four silk scarves, which I had printed at home, to the local dry cleaner and they came back satisfactory. However, they no longer looked ‘new’, they had that look of having been cleaned. I could see a slight loss in depth on the blacks, but no more perhaps than if I had washed them. It was more of a silk surface change than a color loss. What I did not like was the surface of the silk was not as luxurious as before it was cleaned. The hems were mashed flat from the pressing equipment. So, even though my colors were acceptable afterward, and the silk itself was clean, it was no longer pristine. Although I had not worn these scarves, they looked older and like they had a lot of wearing over time. If you decide to try it anyway, you may have to sign a release form before they will do it. You may wear scarves a lot, to work and to various affairs and events. Even so, it is rare a scarf gets actually dirty. If and when your printed scarf must be cleaned, hand washing with a very mild detergent (or liquid hand soap or shampoo) is the best option. Take care not to handle it too much when wet, just enough ‘squishing & sloshing’ to get any dirt out. Then rinse. Don’t wring the water out. You can press it between your hands if you like without twisting it, especially if it is very large. Otherwise let it drip over the sink a bit then lay it flat to dry. While the fibers in silk itself are very strong , wet silk is very delicate. If you saw a little color come out into the water, when you lay it to dry, best to put it on an old towel or something in case there is still color coming out in the dripping. When it is partially dry you can drape it over the shower rod, but wait until all water has dripped out or it could streak. Is there a definite spot on it? Although liquid hand soap or shampoo cleans the scarf safely, they may not be strong enough to get rid of a greasy spot. A dishwashing detergent, such as Ajax or Dove that has a grease removing attribute listed on the bottle will get most spots out without much trouble. Important . Don’t just spot clean. Putting detergent on a spot on a dry scarf can risk leaving a ring on the scarf where it was applied. First get the entire scarf all wet, then apply the detergent to the spot. Let it sit a few minutes to loosen the stain. You may find the stain is gone. Most are with a little soaking like this. If not, add a bit more detergent and very lightly rub the spot, then dip into the water to get rid of the detergent. Look carefully to see if the spot is gone. If not, try once more. There is a chance the spot is from something that won’t wash out. Coffee or red wine may or may not come out this way. I read red wine stains can come out by applying salt and pouring boiling water over it. Well, that might work for a solid color or a white gown, but it could harm a print. Some say club soda will remove wine stains. There are stronger detergents which could be used rather than the ones noted above. Get to the stain as soon as you can. Take time with the soaking and don’t rub it so hard you harm the silk fibers. You don’t want to rub the color off either. Some silks are heavier, some are shinier, some are more textured. Each surface will react to staining slightly differently. The color in the print is a major factor. Whether your print is a graphic with solid colors or if it is a photograph of a landscape, will determine how much the stain shows in the first place, and how well you will be able to eliminate it. If you know your stain is oil-based, as in butter, mayo, baby oil, or gravy, you realize oil and water don’t mix. In other words it won’t come off in plain water. A detergent often will take them out, although some stains like coffee and chocolate can discolor if not removed quickly. I have tried every means I can think of to test for the best way to wash silk prints, in addition to experimenting with dry cleaning as mentioned above. Below are photos of some of the results of washing. These were done on small prints made for the purpose so all the pieces of fabric would be identical to start. This testing was done on new, pristine prints. There were no stains or spots or dirt on them. The purpose was for testing the ink and silk for general washing. I did, however, put a bit of butter on 3 of them before washing, as noted below. Knowing that steam is a post printing process for some methods of printing, and although not needed in printing with pigment, I first tried using the steam iron, for about half a minute to see if this helped 'set' the ink. I read online that someone had success with washing by first putting the silk print into the microwave and using that as a dry heat. There was no mention how long, but I put it in the microwave for 15 seconds. Also I read online that someone had success by putting sea salt into the wash water. They said Epson salts also worked in the water. Again, no directions how much to use. I didn’t have the Epson salts but did have sea salt and made a solution of it and soaked the test print in it. At this time a printer friend of mine also tried the sea salt solution on her similar prints. She has the same printer as I do so her tests were quite compatible with mine. She found using 4 tablespoons of sea salt in a gallon of water worked fine, and she soaked the prints a few minutes, and even her black and white photos did not 'bleed' the black ink into the white areas of the print. This was an excellent test because if any bleeding or transfer of color happens black ink is the worst culprit due to is necessary formula. There was a mention of using vinegar to get the excess ink out of a print. So I decided to see what would happen with that as well. Not so good. I found too much ink came out, but that should be able to be controlled by how much vinegar just as we learned how much sea salt. The last one - well, I did have some Synthrapol which is used for non-pigment ink, but thought would try it anyway to see what happens. And I kept one unwashed to compare. In the photo above, these were all printed on an 8.5x11 sheet of silk satin, then cut apart, so all were printed equally. A is the original print, cut from the whole group. Nothing was done to it. B had the steam iron over it for about 15 seconds. C was put in the microware for 15 seconds. B, C, and D had a smear of butter put on them, then B and C were soaked in dishwashing solution a few minutes. The grease spot from the butter is gone on both of them. D, just as with A, no heat of any kind was applied, but was smeared with some butter, then soaked in a sea salt solution along with the detergent. Again, the greasy spot is gone. E had no heat applied, but was soaked in a vinegar/water solution. No visible color came out in the rinse but the black surface isn’t quite as nice as A. They all look quite nice, and it would be a very picky thing to judge among them. But bottom line, the very best results were C and D.
You can of course try your own tests with your own printer and brand of paper backed silk. 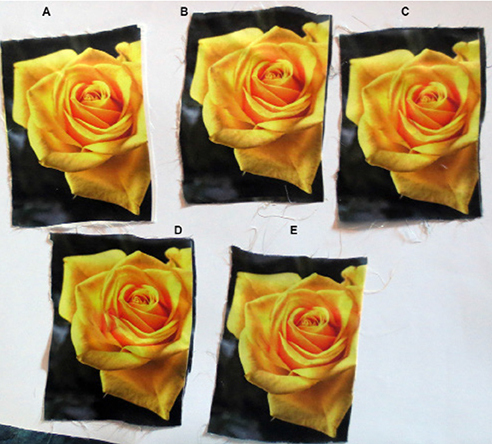 Here are a few methods people have used to add to the washability of the silk printed with pigment ink. 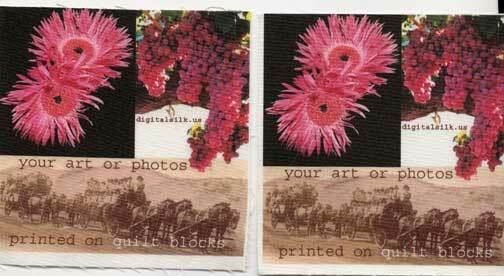 You may find other ideas from blogs and websites because it is of concern to all artists who print on fabric. Steam – some inks require a post-process of steaming. Home printer inks do not. Steam doesn’t hurt, and pressing with a steam iron will make your silk print look nice and smooth after hemming it or otherwise working with it. Take care not to pull the print when ironing so that it stretches the silk out of square. Heat – from testing it appears the addition of heat will help set the pigment with no resulting depreciation of the print quality. Some have tested this theory by placing their print in a microwave a few minutes. A dry iron might harm the surface slightly if left in contact too long, or by excess rubbing of the iron, but the heat of the microwave actually seems to set the pigment ink and avoid the rinsing off in water. Both those methods must be done prior to the silk item becoming stained or dirty. If you get a spot or soil on the scarf, as example, applying heat at that time will only set the dirt or grease spot, not help clean it. It has been found that in your wash/rinse water for either a clean or dirty scarf, you can put some sea salt into the water and this will help keep the ink from ‘running’ off the print. You could do this right after printing, but I’d avoid rinsing the print until necessary. In other words, it doesn’t matter with salt that there might be a stain or spot to clean. The stain came out in a sea salt solution, and with a little dish soap. * Products for UV protection should only be used for wall hangings that won’t be washed or ironed. Don't use them on wearables. If you have used a spray or roll-on of some kind on your fabric print, it more than likely won’t be washable, and I would not recommend trying to iron it. What could happen with the heat is you get the product stuck to the bottom of your iron and mess up the print as well as having to clean the iron. * You may read that putting vinegar in the rinse water will help remove excess ink from the fabric. It does aid in removing ink, but I have found it will take more of the pigment inks out than I wanted, and dark colors - especially black - came out so much it ran into, and discolored, the light & white areas of the print. I have not yet found a way to get those resulting gray casts out of what should be white fabric. Pigment is permanent. Why it ran and stained as a result of the vinegar’s acid currently remains a mystery, so I have no solution. Perhaps you can find one if you like and share. Bottom line, inks are different. Not only the old vs. the new ink formulas, but between brands of printer inks. So, as long as you are printing yourself, you probably have a misprint or boo-boo laying around. This would be one you could cut up into smaller sections and try out what will work for you, on your equipment. As wonderful as digital printing is, it is still quite young and a has long way yet to go. Always use the genuine brand ink for your printer. Yes, small cartridges are pricey, and are gone before you know it, it seems. Some people try to save money by using third-party inks, and these can work okay on paper, but not necessarily so with fabric because their formula may not be as archival. Although all inks have similar formulas, the cheaper inks may not have the same quality ingredients as the recommended brand. If so, the colors may be off, or the prints might not last as long. Even genuine brand inks have an expiration date which could be why you might find some on sale. There are reasons some things cost less. and water as a solvent. The water base did not allow the prints to be waterproof. The dye colors were often exceptional, depending on brands of printer, but they would fade quickly in any light. When pigment inks first were on the market around twenty years ago, the colors were a little disappointing. But the formulas today offer color quality comparable with dye. In pigment ink, rather than using water-soluble dye for the color, small particles of color are suspended in a solution which gives the print its color. These particles of color are coated with a substance that gives them a static charge which makes them cling to the paper or fabric. That is a very simplified explanation, but shows you why the pigment is waterproof – there is no water in its formula. As a result, they won’t wash off in the rain, or fade as quickly in the sun. Laboratory tests have calculated pigment inks will last over 400 years if kept away from light. Well, we do want to see them, so we have to have some light, but not direct sunlight any more than necessary. There is an issue to still be totally resolved with pigment inks. They are indeed permanent, and will not wash away from the fabric. As noted before, any excess ink can rinse off in the first wash, but rough handling and rubbing the surface can rub the pigment off – just as sandpaper will rub off paint on a painted surface. This is more of a factor with the more textured fabrics like linen and some silks which have surface-height differences as a result of the weave. The tops of a very deep texture will get more wear than the crevices. With lighter colors you may not even notice this. But with deep, rich color that was at the beginning overall the same, with wear of the item the print will start looking uneven in color. This was printed on 5.5 oz Belgian linen which has been sewn into a jacket. For the most part, the jacket is still looking quite nice after wearing it three years now. I noticed on the elbow area there were some worn spots in the color while the linen is still looking new. This is a little piece left over during the pattern cutting of the jacket. So I used a dry washcloth and started rubbing on it. Due to the small size the rubbing was not uniform and the original colors remain at the bottom where I held it while rubbing. You can see in the center and upper portion there is definite loss of the medium and dark blues, rather like what happens with blue jeans after a year or so of wearing them. Perhaps it should be no surprise. We expect it in our jeans. But I want you to be aware of this, and realize if it happens, it is a natural thing. But we still wait for the industry to make a fix as they continue to improve both the fabric and ink formulas. You know all about UV light and that you should keep your silks out of the light as much as possible, especially out of direct sunlight. But there is another hidden enemy of silk. Of any print for that matter. That is acid. You likely know about acid free tissue paper and boxes, but may not have thought much why it is important. Acid is just what it sounds like - it eats away at things. In this case, your silk. In paper, acid comes from wood pulp that cheap paper is made from. Newsprint is an example. It doesn’t last very long, it is cheap to produce, and it deteriorates rather quickly. Copy paper is a better quality, but is still made mainly from wood pulp. Tissue paper that you gift wrap with is more than likely made of the wood pulp, unless it is marked on the package that it is acid free. Cardboard boxes are cheaply made for the purpose of holding something long enough to ship it from one place to another. All cheap paper products are mainly made of wood pulp. Wood is acidic. Higher quality printing paper and photograph papers have other fibers mixed with the wood pulp, or are totally made from other fibers that are not acidic. Cotton is one of these fibers that is added to the production of better papers. An artist knows the difference in the feel of drawing paper that is 100% cotton as opposed to common newsprint to draw on. If you are printing your nice art on photo paper whether matte or gloss finish, you know about this - not only is the print quality better, but it will last much longer because of good paper. Your silk ‘knows’ too. If stored wrapped in common tissue, or in a plain cardboard box, its fibers will start to age and will disintegrate over time. You may not notice it for months or years down the road, but it will age much faster than if stored in an acid free environment. You could of course wrap the scarves in a length of cotton fabric rather than tissue. Or line the storage box with something which is 100% cotton. All you need is a barrier between silk and made-with-wood paper. Above you saw photos of test prints on cotton that hand washed beautifully. Your lovely prints you might put into a quilt would have little need to wash - at least not often - unless, that is, a child’s quilt. Or a child’s wearables. It is tempting to print something like a bib for a baby shower. I would strongly advise against using your prints, on any fabric, for children’s outfits or quilts. Firstly, the ink may not be totally safe. Little ones put things in their mouths. Secondly, you know in your heart of hearts the Mama will toss the print into the washing machine with all the other laundry. She doesn’t have time to hand wash. There is no guarantee that even hardy cotton will withstand the washing cycle or the dryer without dramatically fading the print, whatever ink is used. That said, one day I accidently got a delicate silk charmeuse scarf in the washing machine load and didn't notice until it came out of the dryer. It had lost a little color and the surface was not quite as smooth and shiny as before. But other than that, it was OK.
Should you always rinse your print after printing? Some manufacturers of paper backed fabrics instruct to rinse the print after printing to ‘get rid of excess ink’. Some inks used in older printers are just not safe to wash without disastrous results. If your printer uses the older type ink - you know if it does because a drop of rain will make the ink run - it is true there are products you can rinse the print to help set the ink. This would need to be done prior to getting the print dirty or stained. Let a freshly printed silk sit a couple days first to be sure it is thoroughly dry, then follow directions on the container. There is a source list for products at the end of this section. More than likely, you have a printer that uses archival ink because newer printers do. The information would be available on the box that the printer came in, or you can check the maker’s website for type of ink it uses. With these newer inks your printed item should safely wash. A pigment ink is washable. It is possible you will see a little color come out in the water, but that is from an overly saturated print. There are ways to correct this in the file prior to printing which will be detailed in future articles. In general, a snapshot of people or a landscape photo from your camera will not have any issue with excess ink. But this can happen with artwork that has been photographed, or with computer-generated art. If you have tried your best to make the print more vivid, there might be excess ink in that fabric that has not absorbed into the fibers. This will result in the excess ink color coming off in the water. A little ink washing out is normal and is mentioned in the instructions that came with the paper backed sheets. There you will find you are advised to rinse your print after it is thoroughly dry to get rid of this excess ink. This is when you would add something to the water. Those products that you can rinse the print with to set ink, as noted above, work with dye and the older inks, but these don’t affect pigment inks. If your print contains saturated dark colors, especially black, this excess ink ‘runoff’ could stain white or light colored areas of your print. See the following page for things you can do to avoid this. But do avoid overly saturating dark and vivid colors in your image file and in your printer settings. 1) is it really dirty, or only dusty from hanging in the closet?
. . . try gently shaking it first, maybe it is indeed dusty, especially if it has not been covered up for weeks. 2) does it smell stale, or from an old perfume?
. . . if it’s been in a box or drawer, let it be out in the air a few hours. If that doesn’t help, spray it with one of the fabric fresheners on the market. Does it really need washing? Before getting it wet, check carefully for any stain, or grease spot you may not have noticed previously. Treat that as well. Most of the products noted are commonly available in many stores like large chain drug stores, grocery stores and the like. UV protective coatings can be found online from companies selling photo supplies, or art supplies. There are quite a few, some of the larger ones are www.dickblick.com, www.jerrysartarama.com, www.michaels.com. Most cities have art supply stores. Another source is companies selling paper supplies such as www.itsupplies.com/InkJet-Art. Photography supplies are numerous as well, including www.bhphotovideo.com. I mention these companies because I have had satisfactory dealings with them. Solutions to rinse fabric prints can be found at www.dharmatrading.com. Look under ‘transfer products’. You should find acid-free tissue in stationery stores or departments in town. There are several paper product companies on line as well. Art supply vendors noted above may have them in stock. 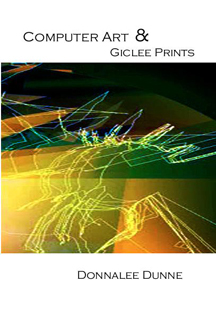 Computer Art & Giclee prints is a trade book covering topics from history of computer art to information for the art collector. Send an email requesting a copy along with your mailing address. The price is $9.95, plus shipping payable with Paypal. An invoice through Paypal will be sent upon receipt of your request for credit card payments. 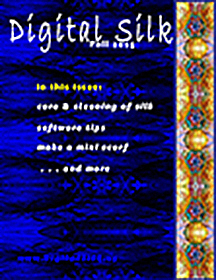 It may be included with any other order at Digital Silk to save shipping costs.